Respiration consists of 4 steps: glycolysis, pyruvate oxidation, the Kreb’s cycle and the electron transport chain. Aerobic respiration occurs when oxygen is present and is efficient in producing cellular energy, anaerobic respiration occurs when the cell lacks an oxygen supply, and is not as efficient at generating cellular energy. Respiration is the process of breaking down organic molecules to harvest chemical energy. For organisms such as humans, it involves taking in food, breaking it down, and turning into useful energy that our cells can use to perform many tasks. This is most efficiently done in the presence of oxygen to make an important molecule called ATP (adenosine triphosphate). Glucose is the compound most often used to generate cellular energy. During cellular respiration, a glucose molecule is completely oxidised, releasing high energy electrons. The glucose molecule itself is broken down into carbon dioxide and water, and during this process, ATP is produced. ATP is a very important molecule in the process of respiration. ATP is the principal molecule for storing and transferring energy in cells, often known as the “molecular currency” of energy transfer. ATP is a small molecule with 3 phosphate groups attached to an adenosine molecule. ATP can be used to store energy for future reactions and can provide an immediate source of energy for reactions needed by the cell. Animals store the energy obtained from the breakdown of food as ATP. ATP generates energy when it is broken down. When one of the phosphate groups is removed in a process called hydrolysis, ATP is converted to adenosine diphosphate (ADP) and energy is released. Energy is also released when a second phosphate is removed from ADP to form adenosine monophosphate (AMP). The release of this energy can be used to facilitate chemical reactions in the cell. NAD+ (nicotinamide adenine dinucleotide) and FAD (flavin adenine dinucleotide).are other important molecules in the process of cellular respiration, acting as important electron carriers. Electron carriers are small organic molecules that play key roles in cellular respiration, where they shuttle electrons between molecules. There are two types of electron carriers that are particularly important in the process of respiration: NAD+ and FAD. When NAD+ and FAD pick up electrons, they also gain one or more hydrogen atoms, switching to a slightly different form (NADH and FADH2), and when they lose electrons, they go back to their original form. The reactions in which NAD+ FAD gain or lose electrons are examples of a class of reactions called redox reactions, which refers to reactions involving electron transfer. Cellular respiration involves many of these reactions. Respiration is a four stage process, consisting of glycolysis, pyruvate oxidation, the Kreb’s cycle and the electron transport chain. Glycolysis occurs in the cytoplasm, converting a glucose sugar into two 3 carbon molecules called pyruvate. A net of 2 molecules of ATP, 2 molecules of pyruvate, and 2 molecules of NADH are produced during the reaction. 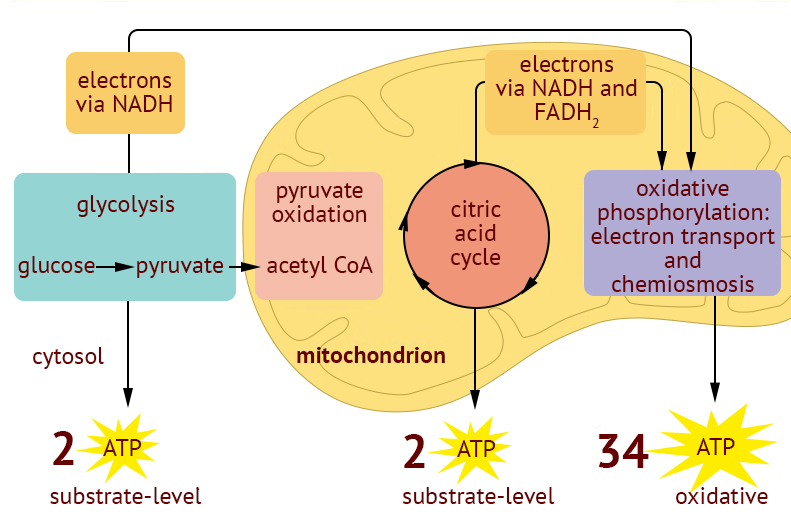 When oxygen is present, the pyruvate and NADH enter the mitochondria, and the next stage can begin. The next stage involves the movement of pyruvate into the mitochondria where it is oxidised and converted into Acetyl-CoA. In this process of pyruvate oxidation, electrons are transferred to NAD+, making NADH, and a carbon is lost, forming carbon dioxide. The next stage is called the Citric Acid Cycle or the Kreb’s Cycle, which takes place in the mitochondrial matrix. It completes the breakdown of glucose by oxidising acetyl-coA to carbon dioxide. Acetyl-CoA binds to the starting compounds in the cycle, and through series of redox reactions, all carbons, hydrogens and oxygens in pyruvate ultimately end up as carbon dioxide and water. 8 NADH, 2 FADH2, 2 ATP and 6 CO2 are produced for each glucose molecule at this stage of cellular respiration. The NADH and FADH2 go to the next stage, the electron transport chain. This chain consists of a series of membrane bound carriers in the inner membrane of the mitochondria that pass electrons from one acceptor to another. As the electrons are transferred, the cell is able to capture the energy produced to generate ATP. Oxygen acts as the terminal electron acceptor, and is reduced to form water, a by-product of the respiration reaction. All of the high energy carriers from previous stages bring their electrons into the electron transport chain. The bulk of energy generated during cellular respiration is produced here, up to 38 molecules of ATP. Cellular respiration refers to both aerobic and anaerobic respiration, but is often synonymous with aerobic respiration. Both aerobic and anaerobic respiration involve chemical reactions which take place in the cell to produce energy, which is needed for active processes. Aerobic respiration requires oxygen to fully oxidise the organic molecule. This releases lots of energy. Anaerobic respiration involves the breakdown of glucose without oxygen. This releases much less energy. Anaerobic respiration is useful in tissues which have a high energy demand such as in muscles, in which there is not enough oxygen to produce all the energy needed by using aerobic respiration alone. Anaerobic respiration takes place in the cell cytoplasm and produces lactic acid.